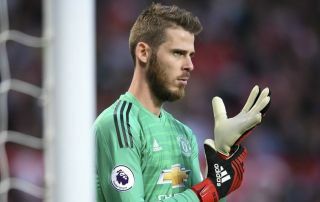 Man Utd owed a debt of gratitude to David de Gea on Sunday after his performance against Tottenham at Wembley helped them secure a 1-0 win. The Spanish international ended the game with 11 saves to his name, frustrating the likes of Harry Kane to help the Red Devils make it six consecutive wins under Ole Gunnar Solskjaer. This was undoubtedly their toughest test to date under the Norwegian tactician, and although they came under real pressure in the second half, De Gea stood up to the challenge and emerged as the hero for the visitors with a string of fantastic saves. With that in mind, Romelu Lukaku and Luke Shaw were keen to show their appreciation for their Man Utd teammate, and managed to get their hands on the hilarious tribute drawing below which shows De Gea closing the shutters on the goal, with the text reading: “Sorry, closed on Sunday”. It will undoubtedly feel as though that was the case from a Spurs perspective, as Kane, Dele Alli and others had efforts saved by the United goalkeeper as he pulled off stops with his feet and hands. Perhaps from a critical point of view, they could have been more clinical as they had some great chances, but it wasn’t their day and De Gea does deserve plenty of credit for his efforts. That’s now five consecutive wins in the Premier League for Man Utd who moved level on 41 points with fifth-placed Arsenal, while they’re now just six points adrift of fourth place. Paul Pogba and Marcus Rashford have been instrumental at the attacking end in their winning run, but De Gea matched that at the back with a stellar performance on Sunday which deserved the praise from his teammates below.